Sample Systems: 30 mm Clear Glass Test. Light Source: 6V Tungsten Lamp. - Display 3½ Digital LED. Display: 3 ½ Digital LED. Range: 0-20 AND 0-200 NTU. We are the leading supplier of Nephelometer in Mumbai, India. he Sensidyne Nephelometer is an advanced real-time hand held dust monitor accurately measuring dust concentrations using proven light scatter technology. Highly advanced, microprocessor based turbidity meter allows measurements based on EPA 180.1, ISO 7027 and other modes. Ideal instrument for testing of drinking water & sewage disposal water measurements upto 1000 JTU/NTU. - Digital Turbidity meter 3 digit LED display range upto 1000 NTU/JTU (Table model). - Laboratory Nephelometer (Analog) Range upto 100 NTU (Table Model). Ecotech provides the broadest and most cost effective range of nephelometers on the market. Nephelometers available from Ecotech include the Integrating Nephelometer, 3 wavelength Backscatter nephelometer, PM correlation nephelometer and Polar nephelometer. Ecotech's nephelometers are easy to use and maintain with very low initial and ongoing costs. 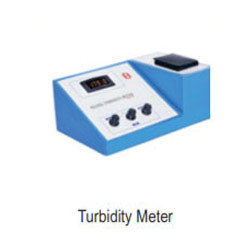 For catering the variegated needs of our clients, we are deeply engrossed in offering a qualitative array of Turbidity Meter. - High resolution : 0.01 NTU/1 NTU. - The unique optics structure, enables the instrument to read low value of TURBIDITY to the high level up to 1, 000 NTU.